On Friday 30, it became clear that the war in Syria is not a civil war. It is now a global proxy war, initiated by Saudi Arabia and Qatar to eliminate Arab governments that do not reliably support the Saudi (or Arab League) position. When the international community was threatened by the spread of violence outside the Syrian border, the U.S. and other European countries intervened to force their regional allies to scale back their belligerence. Russia also intervened in support of its traditional allies in the region. These interventions transformed what was at first a regional proxy war into a global proxy war. That escalation occurred because of several historical and geopolitical factors. Russia, with a long-standing strategic alliance with Syria that goes as far back as the USSR, supported the Syrian government and found itself on the same side as Iran. Iran has had an alliance with Syria since the Iraq-Iran war during which the Gulf States supported Saddam Hussein, who initiated an eight-year old war that killed nearly one million people. The U.S.’s primary regional ally is Saudi Arabia. France and the UK, two countries with billions of dollars in trade and arms deals with Saudi Arabia, Qatar, and the United Arab Emirates sided with Saudi Arabia as well. Turkey, governed by the AKP since 2002, took the side of the Muslim Brotherhood, with whom they share an ideological and sectarian affinity and whose armed militia was crushed in Hama in 1982 by Bashar al-Assad’s father. Jordan, whose massacre of Palestinians in 1970 caused Syria to send an armored division into Jordan, sided with Assad’s opponents. These are just few of the historical and geopolitical reasons behind the strange anti- and pro-Assad alliances. These are self-interested actors, brought together for a single purpose: to overthrow the Assad regime. This was not about defending the rights of the Syrian people or punishing a belligerent authoritarian with blood on his hands—all Arab regimes have blood on their hands. None of these countries on either side really cared about the Syrian people, which is why most of them have failed to take in any Syrian refugees. Even Turkey, which initially opened the door to the families of the rebel fighters, is now pushing them into the sea and driving them into Europe. For four years, these regional and international actors watched as armed groups, both Syrian and foreign, moved into towns and cities inviting retaliation by the armed forces of the Syrian government. Within three years, nearly 70% of Syria’s infrastructure was destroyed. 200,000 Syrians were killed, and nearly ten million people were displaced. All this did not move any sponsors of the armed factions to act. They insisted instead that they had a moral obligation to continue to arm and finance the armed groups until Assad was removed. Then, during the summer of 2015—after the Turkish Islamist party lost its majority in the June 2015 elections, ISIL launched its first suicide attack inside Turkey, and millions of Syrian refugees trekked through Turkey and Greece to Europe—the world began to pay attention. It was Russia’s assertive show of power that forced some key anti-Assad actors to reconsider their positions and take the gravity of the Syrian situation seriously. With Russian forces on the ground, in the air, and on the seas, Syria’s proxy war became a global war. That fact became evident in the October 30th Vienna Meeting, where neither the Syrian government nor the Syrian opposition groups were present. Instead, 17 countries, including Iran—participating in such talks for the first time—as well as the UN and the European Union, sat down to draw a declaration of principles for ending a war that should not have begun in the first place. Four months ago, no one familiar with the key players was optimistic that these countries would suddenly agree on a practical solution to this deadly conflict. But anyone well-informed of the motives behind the primary actors in this conflict knows that the stalemate has been caused by the untenable position of Saudi Arabia and Qatar. They have been demanding, and insisted just days before the start of the Vienna Talks, that Assad be removed through a political settlement or by force. Their position, once again, shows the Saudi rulers’ disdain for participatory governance and peoples’ right to self-determination. Saudi Arabia has a long history of cooking up such deals, none of which have worked. Saudi Arabia engineered the Ta’if accord, which mandated power sharing in Lebanon. As of today, Lebanon has been without a president for 523 days, its parliament has given itself extension after extension instead of holding new elections, and its government is paralyzed to the point that it cannot even haul the trash out of its capital city Beirut. Saudi Arabia engineered a political settlement in Yemen after the Arab Spring uprising there. The deal required then-president Ali Abdullah Saleh to hand over power to his vice president, Abd Rabbuh Mansur Hadi. Hadi was supposed to preside over a two-year transition period, during which Yemenis would vote on a new constitution and elect a new government. Hadi failed to accomplish those goals, preferring instead to stay in power indefinitely. When he was pressured by the Houthis and their allies to hold elections, he resigned, fled to Saudi Arabia, withdrew his resignation, and supported a brutal Saudi-led war on his impoverished country with the aim of reinstating him as the “legitimate” president. In that war, Saudi Arabia has thus far failed to achieve its stated goals, but has managed to hand over the city of Aden and other southern territories to al-Qaeda and ISIL. In Bahrain, when 75% of the population rose up against the corrupt rulers, Saudi Arabia sent its armed forces to crush the protest movement and bolster the regime there. When the Tunisian people rose up against their authoritarian president, Ben Ali, Saudi Arabia offered him sanctuary and froze its investment in that emerging democracy. When Tunisia’s elected government wanted Ben Ali extradited on murder and corruption charges, Saudi Arabia ignored the request and continued to offer him protection, undermining the sole emerging democracy in the Arab world. In a sense, the rulers of Saudi Arabia have been consistent. They prefer a political order imposed top-down, and have never supported a genuine democratic movement or a democratic process for the transfer of political power. Instead, they have preferred to make deals that exclude the people. That is what they want for Syria as well: a political solution imposed on the Syrian people without regard for democracy or self-determination. Saudi Arabia does not promote solutions that are democratic and transparent, and will never willingly agree to a process that would leave the decision about Assad’s fate in the hands of the Syrian people. Instead, they must be forced to agree to it. First, the U.S. is distancing itself from the Saudi position. After the meeting, the State Department released a photo of the participants in the Vienna Talks, showing Saudi Arabia sitting at the end of the table farthest from where Secretary Kerry was sitting. 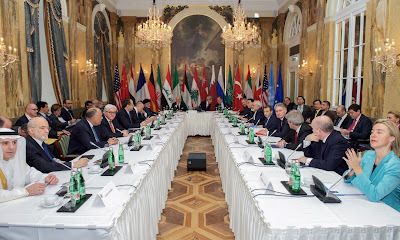 Importantly, it showed Secretary Kerry at head of the table, with the Russian Foreign Minister Sergei Lavrov on his left and UN Special Envoy to Syria Staffan de Mistura on his right. The U.S. is finally playing the role of facilitator, not party to the conflict. That is a good sign, and a hopeful one for the Syrian people. The fact that the participants agreed on these principles is a huge success. The principles recognize the right of the Syrian people to decide on the nature of their constitutional rights and next generation of leaders, and reflect an ability to prioritize the fight against terrorism and identify the violent groups that must be opposed. The Joint Statement is explicit in identifying the groups that must be fought and excluded from deciding the future of Syria: (1) those who want to redraw national borders (ISIL), (2) those who want to establish a Sunni-dominated religious state (ISIL, al-Nusra, Ahrar al-Sham, Jaish al-Islam, The Syrian Islamic Front, and any other group aspiring to impose their own version of Sharia), (3) any group that promotes a sectarian agenda. The Joint Statement also explicitly resolves the dispute over the fate of the current Syrian president by stating unequivocally that the Syrian people are to choose their next president, not Saudi Arabia, Turkey, Russia, the U.S., or the UN. The world community can only help by ensuring that the Syrian people are able to exercise their rights and carry out their duties under safe, free, and transparent conditions. With these principles, it is clear that Saudi Arabia was rebuked for insisting on the removal of the president of another sovereign country, particularly before they act to stop funding and arming terrorist and sectarian fighters in that country. The Syrian people—the dead, those living under siege, and those displaced—have paid for this proxy war in blood and tears. They are the only people with the right to decide these matters, not outside forces who sought to use them to settle a geopolitical score. It is hopeful that the U.S. is finally embracing a principled solution over the self-interested positions of allies like Saudi Arabia, who continue to be a burden on U.S. foreign policy.